"Gordon follows these familiar cues with an obvious passion for the genre and a skill at setting vivid scenes. He invests Akron, Emerald and the rest of the characters with impressive amounts of life, and he describes battles with a fine-tuned attention to detail." "The book offers an interesting twist on the fantasy formula, and fans of the grittier takes on the genre are sure to find something to appreciate here." "In a mythical kingdom, passionate love between a young man and a female dragon transcends the ordinary romantic fling. Enter an incredible fantasy that defies even magic in Alex Gordon's Emerald, a story that takes place in a medieval-style realm teetering on the brink of disaster after an exhausting war." "His passionate characters reflect stamina and strength. 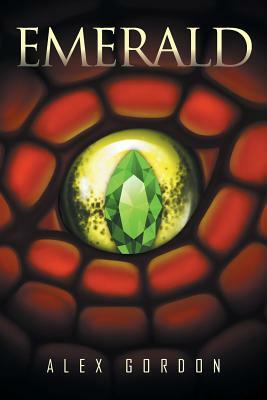 Emerald will delight fans of mystical kingdoms where fantastical creatures take on distinctive personalities, lending a unique voice to the narrative." One thousand years ago, one million human and dragon are camped in what is known as the valley of tears. They woke one morning there loved turned to hate and left for battle with wife child and mother pleading from them to stop fighting and marching with sword axe in hand. One thousand years after a young man a vagabond is laying about in the world somewhere resting form a fruitless search. The young man is wounded where in the world he needs to travel to find his friend a dragon so his search can end and he can go home.